Bones are one of the basic part of human body. We can't imagine a body without the skeleton. The 206 bones in our body are not just a supporting mechanism for our body but much more than that. Most of us don't know that new blood is created inside these bones, and that blood is most important fluid in our body. You will get to know much more about our incredible bones in this article. At the time of Birth, a newborn baby have 300 bones. Some of these bone fuse together as we grow and till adulthood we have 206 bones. Femur (the thigh bone) is the longest and strongest bone in our body. Femur can bear a force of 1,800 to 2,500 pounds. Its hardest to break. Stapes (a bone in middle ear) is the smallest and lightest bone in our body. It measure 2.8mm. We have 27 Bones in each Hand and 26 in each foot. Bones stop growing in length during puberty. Arm bone is most prone to fracture in Adults. Collarbone is most prone to fracture in Kids. Hyoid, a V-shaped bone located at the base of the tongue, is the only bone in our body which is not connected to any other bone. 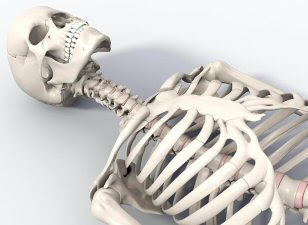 Bones act as a skeleton and helps in body movement. Our teeths are part of Skeleton system, but not counted in bones. Male and Female skeleton are almost same, only pelvis bones differ in shape, size and angle to help in child birth. Bones also protect us from impact damage. From outside bones are very hard but from inside they are like sponge. Most internal part of bones have a very soft tissue known as Bone Marrow. Red and White Blood cells are manufactured inside bone marrow. After a fracture our bones can regrow and repair themselves. Plaster is used to make sure that these bones repair straight. There are 3 major diseases of bones. Osteoporosis increases the chance of fractures, Scoliosis is a curvature of the spine, while arthritis is inflammation in bones that damages joints. One in every 500 people have an extra rib. But its usually a health issue known as thoracic outlet syndrome. Bones are stronger than steel, but not the hardest part of our body. Tooth Enamel is. Bones account for 14% of total body weight.